Rampant farmers’ suicide, unscheduled power cuts and Congress’ ‘goondagardi’ have become the hallmark of Captain Amarinder Singh’s government in two months of its rule in Punjab, said Punjab BJP. 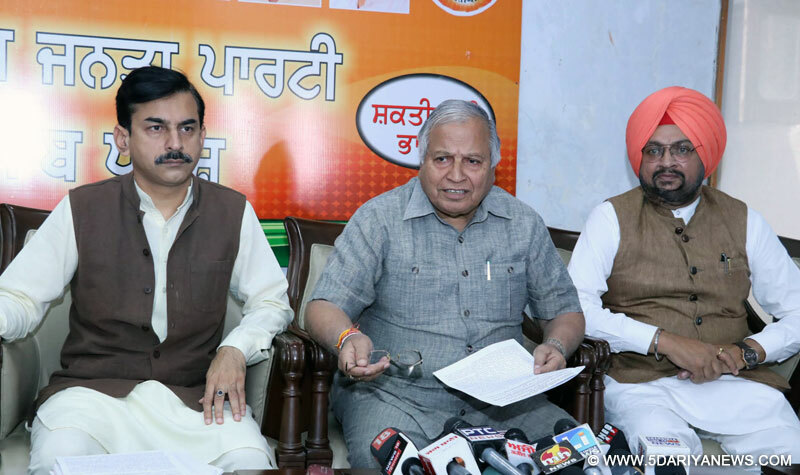 Addressing a press conference here today, senior BJP leader & former Punjab minister Madan Mohan Mittal, State BJP vice-president Harjit Singh Grewal, state general secretary Manjit Singh Rai and state secretary Vineet Joshi said that during these sixty days, Punjab has witnessed a deep surge in farmers suicide, goondagardi of Congress workers, unscheduled power cuts, protests by parents against loot by private schools, protests against liquor vends, prices of sand and gravel, open availability of drugs, sacrilege of Sri Guru Granth Sahib, atrocities on Dalits, gang war, attack on Press/media and VIP culture.“There is a shocking increase in farmer suicides in Captain Amarinder's second month of rule. In the first month i.e. from sixteenth March to 15th April sixteen farmers committed suicide but in the second month i.e. from sixteenth April till fifteenth May, twenty six farmers committed suicide in villages like Shankar of Ludhaina District, Dangarh near Dhanola, Jharora & Tusa near Jagraon, Senhawali near Mansa, Ratta Tibba near Malout, Makha Chehla near Mansa, Bhogpur near Jalandhar, Shahkot, Phillaur, Uddat Bhakta ram, Jodhpur near Barnala, Gobindpur near Nathana, Sawdi Kalan, Durga near Mastuana Sahib, Chauke, Gurdaspur, Bhenibhaga near Mansa, Joga, Rampura Pind near Rampura Phul, Thikriwal near Barnala, Kartarpur Basti near Sangrur, Dhilwan near Tapa, Vandar near Moga, etc.”, the leaders said. “All this happening due to Chief Minister Punjab Captain Amarinder's failure to fulfill pre poll promise of waiving Farmer/ Agricultural Loan in the very first cabinet meeting”. Farmers who already are under severe debt got further depressed, demoralised, dejected and felt cheated, hence leading to spate in farmers suicide. Announce full waiver of Farmer/ Agricultural Loan and save farmers from dying, emphasised the BJP leaders. BJP leaders further stated ,”After so many years Punjab is witnessing unscheduled power cuts ranging from five hours to twenty two hours on daily basis. Not only it has made life miserable of the residents but at the same time farmers also are unable to sow paddy. People are protesting on streets, Framers are blocking roads, sitting on dharna outside power com offices. BJP-SAD left Punjab as power surplus state and in the last few years there were no power cuts rather power was available round the clock”. “This is a clear case of mismanagement by Punjab Govt. Chief Minister should take stern action against the erring officials of PSPCL & PSTCL and ensure twenty four hour unhindered power supply”, they demanded. ‘Goondagardi’ of Congress workers/leaders is one which Captain Amarinder Singh needs to contain with iron hand. Congress leaders are attacking, shooting, killing Leaders/ workers/ sympathizers of opposition parties in the state. Incidents of Congress gondagardi in Gidderbaha, Village Mida near Malout, Amritsar Bus Stand, village Bhunder in Mukatsar, village Khirkianwala Gidderbaha, Village Kiali Chehla Wali, Tehsil sardulgarh, village Chet Singh wala of attari Segment, District Amritsar, Village Rukah Shah Wala, Ferozepur, Village Gharala, district Gurdaspur are eye opener.In every small town, village and city parents are protesting against the abnormal hike in school fees and other funds by Private Schools. At many places, on the behest of School managements, Police have booked protesting parents. Punjab Government have failed to contain these Private Schools despite a law which was formed by SAD-BJP Govt and notified by your Govt. Captain Amarinder should pull up education department for effective implementation of Punjab Regulation of Fee of Unaided Educational Institutions Act. 2016, they said. “Chief Minister Punjab has turned blind eye towards Congress leaders led Transport Mafia. Incident of firing at Amritsar Bus Stand or plying of buses without permit and time table in Doaba and Majha regions are few examples of Transport mafia led by Congress leaders and workers”, detailed Grewal and Joshi. Liquor mafia is ruling the roost and Punjab government has turned a blind eye to the protests by people of Punjab especially females against liquor vends in residential areas, villages, near educational institutions & religious places, etc. To name a few, people are protesting in Bareta, Sohana in Mohali, Ramdass in Fatehgarhsahib, Shahkot, Bhawanigarh in sangrur, Kurali, Rupnagar, Lehra Mohabbat, village gill near Ludhiana, Bhawanigarh, Malout, Balachour, Village Nagla and lohgarh in Zirakpur, Banur, Morinda, etc. Captain Amarinder should take note of all these protests and shift or close such liquor vends, demanded BJP Leaders.“Punjab government has badly failed in containing the incidents of Sacrilege of Sri Guru Granth Sahib,Gutka Sahib and other holy books. More than ten incidents of Sacrilege has taken place. The government should take effective steps to ensure that such things doesn't happen”. Atrocities on Dalits are on rise. There is a great feeling of insecurity among them. Incidents in Sardulgarh, etc are hair raising. Reign in your party cadre and take action against police officials who failed to act, demanded BJP leaders.Gangs with patronage from ruling party leaders are calling the shots. Incidents in Bathinda, Batala, Amritsar, Jalandhar, Nurpur Bedi, etc. has lead to people believe that either these gangs have patronage of ruling party/government or police have badly failed in containing them. Whatever may be the reason, adopt a policy of zero tolerance towards gangsters and take action against SSPs in whose area incidents take place, demanded Joshi & Grewal.The leaders said, “Since the last two months, mining mafia is calling the shots. Goonda Tax has lead to steep rise in prices of sand and gravel. Officials of mining dept are either ignoring due to pressure of ruling party or are hand in glove with them. Whatever may be the reason but illegal mining is at all time high in Punjab. Chief Minister should take immediate steps to contain illegal mining and bring down the prices of sand & gravel”. MLAs and leaders of Congress are trying to take control of Municipalities, Nagar Panchayats and panchayats by threatening the elected members of SAD-BJP alliance. It's clear cut murder of democracy. Reign in your MLAs, MPs and leaders or else we will hit the streets ,said Grewal and Joshi.“Congress leaders and workers are openly attacking the media persons and threatening them to fall in line. Freedom of media is under threat, an urgent, strict intervention is needed at your end. Take necessary steps to ensure security of journalists and freedom of media”. BJP leaders said, “During campaigning, you and your leader Sh Rahul Gandhi repeatedly said that 78% Punjabis are drug addicts, now, as Chief Minister of Punjab, with two month in office, either substantiate your allegation with evidence or tender an apology for defaming Punjabis. We believe your pledge to eradicate drugs with Gutka Sahib in hand stands violated as drugs are available in every nook and corner of Punjab. BJP leaders asked Captain Amarinder to take effective steps beyond press releases to control it”.“Your decision to end VIP culture by prohibiting the use of red beacon has emerged as mere tokenism. Give practical shape to your announcement to end VIP culture by not using the helicopter as promised in your election manifesto. Free electricity to Gaushalas initiated by previous SAD-BJP Govt has been stopped by Punjab State Power Corporation Limited. Issue orders to restore free power to all Guashalas in Punjab”, they said.“All above issues are concerning common man of Punjab, resolve them immediately, else we will be compelled to launch a state wide agitation”, concluded BJP leaders.